The IDAY Awards is some serious wedding industry kudos based on real wedding customer reviews. Real married people (that’s you) appraise the suppliers whose services they employed for their wedding – in a number of different categories. The scores are then collated and used to recognise those wedding industry vendors who most consistently go the extra mile and ensure that the much touted ‘Best Day Ever’ lives up to the hype, and even better, exceeds the couple’s expectation. What we need is honest critiques – not just purchase affirming five-star reviews – so that only the real cream of the industry rises. And for every individual supplier you submit a review for, you’ll get an entry in the prize draw. So… what are Yewww waiting for? Submissions are open until November 30 2018. “I Do & Yewww” is the phrase on which we hang our hat. When we first coined it, we were humbly stoked with ourselves. We felt we’d successfully created a pretty bang-on branding tagline. Afterall, as Jake & Andy, we provide an awesome marriage celebrant (the I Do) and a kickass wedding soundtrack (the Yewww). But as time has passed we’ve begun to realise it stands for other things too. Other less literal things. Other more meaningful things. I Do & Yewww means we’re with you from start to finish – while planning as well as on the day. I Do & Yewww means we want your wedding to be the ultimate celebration. I Do & Yewww is our public commitment to a superior product and experience. Last year we decided to let our favorite wedding vendors know that we loved their work. So for Christmas we sent out a sackful of ‘certificates of radness’ that we called the I Do & Yewww Awards. Pretty lame and corny, but it’s the thought that counts, right? Well this year we’re making it legit. We’re asking every past client of Jake & Andy to submit vendor reviews. We’re asking for honest appraisals – not just five-star reviews – of any supplier that you hired for your weddings. And when the submission period ends, we’ll crunch the numbers and shout the kudos. What’s In It For The Reviewer? To encourage reviews and ensure as accurate a result as possible we’re dangling $250 worth of carrots. The winners of these dining vouchers will be announced by mid-December 2018. What’s It Mean For The Vendor? Notoriety and the honour of being a mutha flippin’ IDAY Award Winner! Unlike other wedding industry awards, the IDAYS do not require suppliers to pay a subscription fee or membership to be eligible. They’ve just got to do a bloody good job all the time. Reviewed vendors who achieve a score in the top 15% for their category will become an IDAY Awards ‘Finalist’ and be supplied with a plaque saying so (in the form of a web-ready PNG image) which they can display on their websites and share on their socials. 2018 IDAY Awards Finalists will (if not already included) be added to J&A’s Vendor Love directory for 2019 and displayed as an IDAY Awards ‘Finalist’. The single highest scoring vendors in each category will be awarded the ‘Golden IDAY’ plaque (PNG image) as well as a physical I Do & Yewww Awards ‘Winner’ certificate which can be displayed in the office or workplace. 2018 IDAY Awards Winners will claim the premium position in J&A’s Vendor Love directory for 2019 and be displayed as the 2018 IDAY Awards ‘Winner’. Category winning vendors will be featured together in a special IDAY Awards blog. Category winning vendors will be acknowledged individually in a Vendor Love feature profile blog. Category winning vendors will appear on the following year’s (2019’s) IDAY Awards webpage with a logo/feature image (linking to their website). Category Finalists & Winners will be announced late-December 2018/early-January 2019. 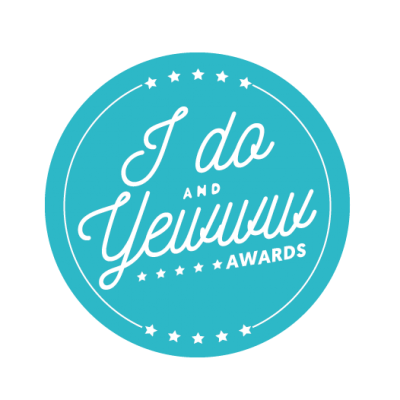 The 2018 I Do & Yewww Awards will award finalists and winners in nine categories. These are, the wedding industry’s raddest Celebrant; Venue; Styling/Hire Co.; Florist; Catering Co.; Planner/Co-ord; Photographer; Videographer; and Misc. Wedding Vendor. The 2018 IDAY Awards submissions are open to individuals/couples on Jake & Andy’s existing customer database, who have already had their weddings (no ‘future weddings’) exclusively. Reviews submitted by persons other than those on J&A’s existing database will not be counted. Eligible couples will be contacted by email and notified about the prizes available, and supplied with a link to follow to submit their vendor/supplier reviews. Because 2018 IDAY Awards submissions are open to individuals/couples on Jake & Andy’s existing customer database exclusively, only vendors who have worked (on the same weddings) with J&A are eligible. Vendors that don’t clearly fall into an existing award category are still be eligible for review (and an award) via the ‘Misc. Wedding Vendor’ submission form.